The humble arena shooter appeared to be at the cusp of a huge resurgence earlier this year, but at the moment it feels like we're waiting for a huge title to usher it in properly. 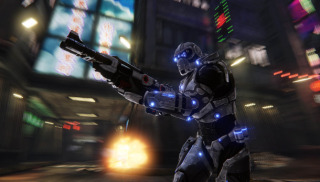 Whether that will be DOOM or the forthcoming version of Unreal Tournament is yet to be seen. Toxikk is among the brighter of the indie arena shooters in development, and Reakktor Studios is still plugging away at it. Just yesterday they rolled out V.09, which introduces a new map, Dekk, among other things. Dekk can be seen in the video above, and it's the first one in Toxikk with an explicitly sci-fi inspired theme. "The map is based on an over a decade old layout introduced by UT, now reincarnated with clean, yet highly refined/accentuated 3D assets, keeping visual clarity and simplicity in mind," a spokesperson for the studio writes. There are some other changes too but they're minor: the game now supports multiscreen, albeit temporarily, and there's a new Max Damage Boost collectible which, as you can probably guess, raises your maximum damage output. The full update notes can be perused here. Toxikk is still in Early Access and appears to have built quite a strong community. Omri Petitte enjoyed what he played back in January. "I wouldn’t say it’s deserving of a pedestal next to UT or Quake just yet, but I wouldn’t discount its potential either," he wrote.